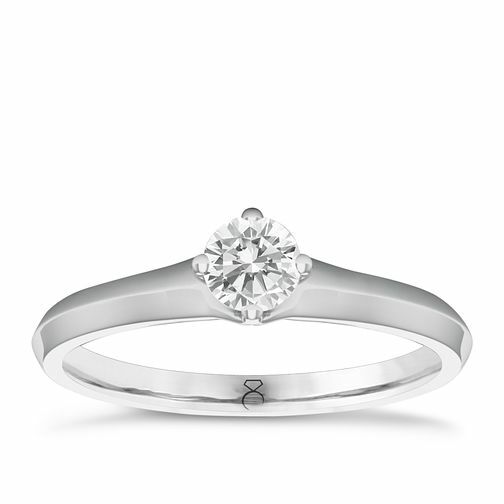 Set with a brilliant, round cut 0.20ct H-I P1 diamond solitaire in an elegant four claw setting, this beautiful polished 18ct White Gold ring is certain to be treasured. Celebrate your engagement with a one-of-a-kind ring by The Diamond Story, Certificated by GSI. The Diamond Story 18ct White Gold 0.20ct Diamond H-I P1 Ring is rated 3.0 out of 5 by 1. Rated 3 out of 5 by Anonymous from Beautiful ring but has gone yellow! Absolutely beautiful ring, and I love the style and fitting on my finger. Unfortunately it has already turned a yellow shade (I've been wearing it for less than 3 months!). I know I can get it replated free in the 1st year after purchase but might wait until just before the wedding!! I wouldn't recommend white gold for a ring you are going to wear every day.